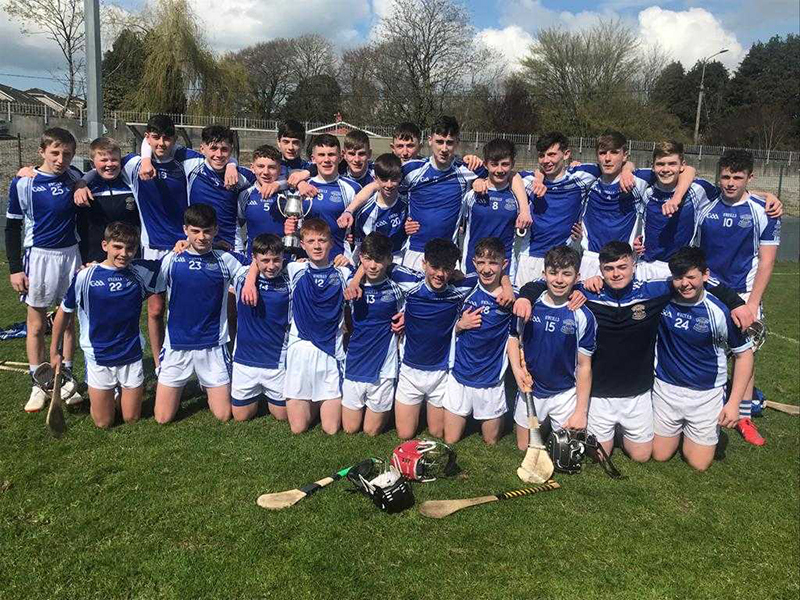 Thurles CBS defeated De La Salle Waterford by 1-9 to 0-7 in the 2018/2019 Dean Ryan Cup (Under 16.5 A Hurling) Final played at Bansha on Friday. A gritty Thurles CBS team dug deep at Bansha on Friday afternoon and in absolutely brutal conditions battled their way toward a five-point Dean Ryan Cup final win over De La Salle, Waterford – the Tipperary school have now placed Munster under-16.5A post-primary school hurling titles back-to-back and heartily celebrated their 14th success at the grade. The final moments of this decider were fitting – in the 63rd minute Thurles CBS centre-back Luke Shanahan won a ruck, burst forward and was fouled before referee John O’Halloran blew the final whistle. Winning the battle was the absolute key to deciding this final and Thurles CBS won that battle with something to spare. Jack Leamy caught the eye when notching three points from play while Stephen Ferncombe and David Fogarty had their moments up front, but this final was won in the raw fight for supremacy in the middle eight. And, there Thurles CBS found real heroes in Ryan Walsh, Darragh Stakelum, Edward Meagher, Edward Connolly and, of course, Luke Shanahan who was the outstanding candidate for the man of the match award. The Upperchurch-Drombane man’s reading of the game, striking, sensible positioning at six and determination to get down and win that ruck ball made him the key influence on this final. 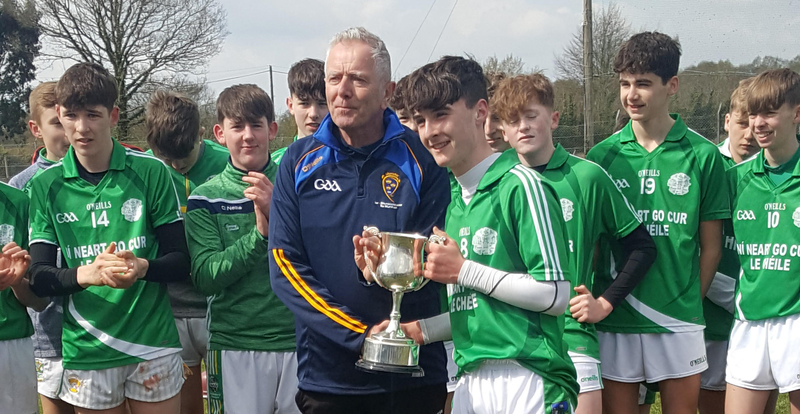 The Thurles CBS squad were guided by a management team comprising of Martin Maher (Borris-Ileigh), John Devane (Clonoulty-Rossmore) and Niall Cahill (Emeralds, Urlingford). 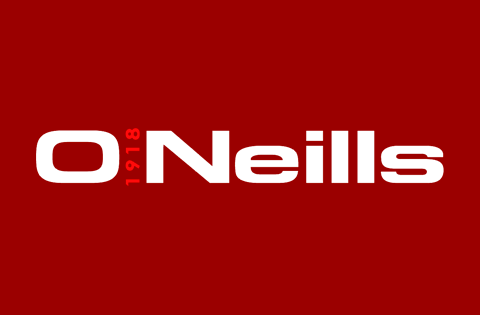 In the semi-finals of the competition Thurles CBS accounted for Nenagh CBS (2-22 to 1-9) while at the quarter-final stage Thurles CBS proved too strong for Midleton CBS (4-16 to 1-15). In round one Thurles CBS enjoyed a seven-point win over St Joseph’s, Tulla (0-15 to 0-8). 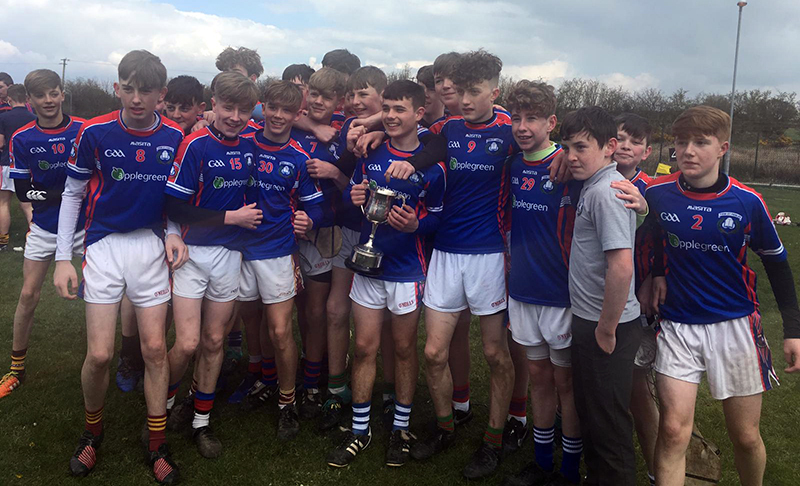 Thurles CBS have now won fourteen provincial titles at the grade (1936, 1939, 1945, 1947, 1950, 1952, 1955, 1956, 1960, 1965, 1992, 2010, 2018 & 2019). Playing with the aid of an absolute gale De La Salle got off to an encouraging start with efforts from Micky Cummins (free) and Lee Hearne helping the Waterford side into a 0-2 to no-score lead. 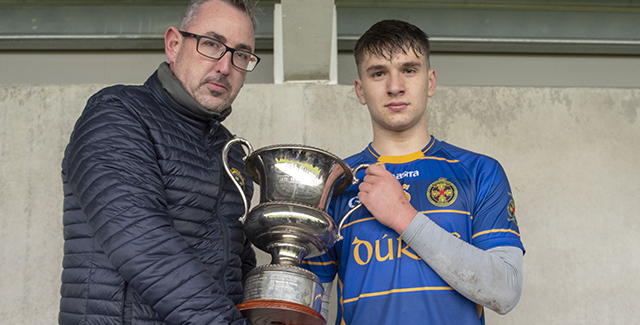 Thurles CBS, however, settled down to their task and opened their account in the sixth minute when Liam McCormack battled superbly in atrocious conditions before setting up David Fogarty for a neat point. De La Salle tried to unsettle Thurles full-back Darragh McCahey with a series of searching deliveries, but the Loughmore-Castleiney man coped admirably. Then in the 16th minute Thurles CBS struck for a vital David Fogarty goal; Darragh Stakelum won a ruck in the middle of the field and fed Stephen Ferncombe who carried well before finding his inside line. Liam McCormack and Jack Lillis then combined smartly to set-up Fogarty who delivered a composed finish (1-1 to 0-2). De La Salle tied the game in the 28th minute following two converted placed balls which arrived courtesy of Seán Burke and Micky Cummins. Thurles CBS, however, hit back in the 31st minute when Edward Meagher was fouled and Stephen Ferncombe converted the resultant free. A Mark Fitzgerald effort levelled matters at the break (1-2 to 0-5), but with the elements in the second half Thurles CBS now found themselves in a terrific position. Three successive points during the opening sixteen minutes of the second half forced Thurles CBS three clear (1-5 to 0-5). A Stephen Ferncombe free edged his side into a narrow lead before Darragh Stakelum won a terrific ball in the 42nd minute and found Jack Leamy with a smart hand pass – the Golden-Kilfeacle man drilled over a superb point off his right. Luke Shanahan gave an exhibition of sensible centre-back play and the Thurles CBS number six set Stephen Ferncombe for a brilliant score in the 46th minute. De La Salle survived a frantic goalmouth scramble in the 36th minute following a huge Edward Connolly delivery, but the Waterford lads opened their second half account in the 47th when Micky Cummins landed a free. Thurles CBS’ David Fogarty enjoyed a slight sniff of goal in the 48th minute, but his snap shot flew narrowly wide before a Jack Leamy effort re-established the Tipperary schools’ three-point lead (1-6 to 0-6) in the 52nd minute. A Micky Cummins free dragged De La Salle to within touching distance once more, but Luke Shanahan notched the score of the game in the 54th minute when the Upperchurch-Drombane star read the play, intercepted a hanging De La Salle delivery, strode forward and landed a right-handed shot from long-range. Thurles CBS’ endeavour deserved a second goal and it appeared as if they had created a key opportunity in the 56th minute when Pat Ryan worked especially hard to turnover a De La Salle defender only to see his pull get held up on the line in a pool of water (much to the relief of ‘keeper Cormac Dawson). Unperturbed Thurles CBS added two more late points which arrived courtesy of Jack Leamy (his third from play) and Stephen Ferncombe (free). Subs: (40th) Pat Ryan (Upperchurch-Drombane) for Liam McCormack, (51st) Robert Doyle (Clonoulty-Rossmore) for Jack Lillis, (59th) Sam Quinlan (Holycross-Ballycahill) for Darragh Stakelum. Remaining panel members: Ethan Blake (Drom & Inch), Joe Brooks (Roscrea), Joe Caesar (Holycross-Ballycahill), Michael Connolly (Loughmore-Castleiney), Michael Fitzpatrick (Drom & Inch), Emmett Fogarty (Durlas Óg), James Griffin (Upperchurch-Drombane), Liam Hayes (Moycarkey-Borris), Ben Hennessy (Holycross-Ballycahill), Toby Lambe (Holycross-Ballycahill), Alex Lawlor (Fenians), Darragh Minogue (Durlas Óg), Oisín O’Brien (Durlas Óg), Dáire O’Connell (Fethard), Jack O’Mara (Durlas Óg), Killian Rafter (Durlas Óg), Conor Ruddy (Durlas Óg), Daniel Ruddy (Durlas Óg), David Sherman (Galmoy) and Pádraig Treacy (Loughmore-Castleiney). Subs: (12th) Seán O’Dwyer for Luke Horgan, (38th) Luke Horgan for Ely Cullen, (51st) Patrick Fitzgerald for Lee Hearne, (53rd) Aaron Wymberry for David Corcoran.